2004: Jean-Philippe “JP” Le Guellec becomes first Canadian to win an International Biathlon Union (IBU) Youth World Championships title (in the youth men’s sprint). 2009: Kurtis Wenzel becomes second Canadian to win at IBU Youth Worlds, with a gold medal in the youth men’s sprint. 2012: Wenzel does it again as a junior, winning the 15-kilometer individual at IBU Junior Worlds. Feb. 22, 2017: Leo Grandbois shoots a perfect 20-for-20 to become the third Canadian to be crowned a world champion at Youth/Junior Worlds, winning the youth men’s 12.5 k individual in Osrblie, Slovakia. One day later: Megan Bankes repeats the 20-for-20 shooting feat in the junior women’s 12.5 k individual in Osrblie and becomes Canada’s first woman to win at Youth/Junior World Championships. And just like Grandbois, Bankes had never hit 20 consecutive targets without a miss in a race before. In fact, she had never cleaned a race of any length before. Doing so earned her a gold medal in her first race of her fourth Youth/Junior Worlds. As the 19th starter in a field of nearly 70 women, the 19-year-old Bankes, who trains with the Biathlon Alberta Training Centre (BATC) in Canmore, set down the performance to beat with clean shooting and a finishing time of 37:22.0 minutes. She bumped Germany’s Anna Weidel, the 13th starter, to second place with a time that was 1 minute and 20 seconds faster. Weidel had missed just one shot — still an impressive performance in a four-stage race — in the first standing stage (0+1+0+0). Each miss adds a minute penalty to a racer’s total time. Her overall course time ranked 11th, comparable with the two women she ended up sharing the podium with. Weidel was ultimately pushed to third when Austria’s Julia Schwaiger in bib 26 finished 32.1 seconds faster for silver. With one costly miss in her final standing stage (0+0+0+1), Schwaiger’s finishing time was 47.9 seconds short of gold. That medal went to Bankes, one of five women in the race to hit every target. “I shot with a lot of confidence today. It came really easy,” Bankes told Biathlon Canada. But, as there usually is, there was a backstory on Thursday. “She had a what she said was a ‘horrific’ zero,” her coach Richard Boruta explained of her pre-race target practice, in an email co-written with Canada’s trip leader/head coach Jacqueline Akerman. Boruta tried to calm Bankes down, assuring her that she had the self confidence to execute strong shooting. According to them, one of Bankes’s longtime goals had been a top eight at these championships. 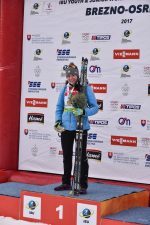 That changed after she broke through on the IBU Junior Cup earlier this month, placing second in the 10 k pursuit at IBU Junior European Championships in Nove Mesto, Czech Republic. After that, she visualized herself in the top five, maybe top three, in her first year as a junior at world championships. Bankes had previously notched 18th in the pursuit and 19th in the individual at last year’s Youth World Championships in Romania. Individual-format races require solid shooting and fast skiing, just like any biathlon race, but the one-minute penalties as opposed to penalty laps put an emphasis on shooting accuracy. “After I got the silver [in Nove Mesto], I knew if I shot and skied well, I could get a medal here,” she told Biathlon Canada. “It takes a long time to get to this point. I think having been here [at Youth/Junior Worlds] four times now I have the experience to do this. I have everything around me here that I need to be successful. According Akerman and Boruta, they had anticipated that Grandbois and Bankes would have “a respectable chance” at a medal, along with other team members as well. But two gold medals in two days? They credited “consistent and qualified coaching support in yearly developmental stages”, and explained that Bankes started the sport with coach Iaroslav Khomiak at Foothills Nordic in Calgary. She was later coached by Tyson Smith (Nathan Smith’s brother, who is assisting the team at Youth/Junior Worlds) before joining the BATC group in Canmore in 2015. “My observations of this current group; they are pretty grounded, are very motivated, focused and are they are both pushing and supporting each other in all aspects of their performance,” Akerman and Boruta wrote. So what does two gold-medal performances mean for Canada? In the junior women’s race, Canada had two in the points (top 40) and one just outside with Emily Dickson in 28th (+4:21.3) with one miss (0+1+0+0). Nadia Moser finished 41st (+5:55.8) with four penalties (2+0+0+2). Charlotte Hamel did not finish. For the U.S., Siena Ellingson placed 50th (+7:11.5) with four penalties (0+1+2+1) and Nina Armstrong 65th (+14:15.3) with eight misses (4+1+2+1). Earlier in the day, the junior men raced a 15 k individual, which Norway’s Sindre Pettersen won in 40:17.2 minutes. He started 68th and cleaned three-straight stages before missing two on his last standing (0+0+0+2), but managed a 51.2-second win over Germany’s David Zobel. An early leader in bib 26, Zobel had three penalties (0+2+1+0) yet his time held up for silver despite a challenge from Russia’s late starter Nikita Lobastov (bib 84). Lobastov shot 19-for-20 (0+1+0+0) and finished just four seconds short of Zobel for third place (+55.2). Only one athlete in the junior men’s race cleaned: Latvia’s Ingus Deksnis in fifth. In his first year as a junior, Canada’s Zachari Bolduc led the North Americans in 34th (+3:44.7) with two penalties (1+0+0+1). He later told FasterSkier his goal had been a top 30, and he was 8.4 seconds short of it on Thursday. He was followed by Canadian teammates Trevor Kiers and Jules Brunette in 54th (+5:21.6) and 55th (+5:27.4), respectively, after each shot five penalties. Pearce Hanna finished 65th (+6:38) with seven misses (1+2+2+2). The top American on Thursday was Cody Johnson in 50th (+5:08.3) with two penalties, both in the last stage (0+0+0+2). Cameron Christiansen followed in 72nd (+8:10.6) with six penalties (1+1+2+2), and Peter Carroll was 79th (+10:36.4) with four misses (0+3+0+1). Travis Cooper did not start. The youth men’s and women’s sprints are scheduled for Friday in Osrblie.